In 1940s New Jersey there were no high school girls’ tennis teams, so she played with the boys. That was, until she started winning matches. The state athletic association ruled it was “mentally harmful” to boys if they were beaten by girls, and she was kicked off the team. But she was at the same time excelling in USTA tournaments with her mix of competitive spirit and a strong sense of fair play, in 1943 captaining the national U.S. Junior Wightman Cup Team and receiving the national USTA Girls’ Sportsmanship Award. By the time Pratt graduated high school, women’s sports were coming into their own. Rollins College in Winter Park had founded a women’s tennis team years earlier, and Pratt studied English and psychology while playing the No. 1 singles position. In her senior year she was honored with the Algernon Sidney Sullivan Award for citizenship, by this time beating the boys to their applause. Pratt’s success on the pro tour out of college was immediate. In 1947, the year of her graduation, she won the Cincinnati tournament that is now known as one of the largest stops on the WTA tour. She would compete professionally for the next 21 years, gracing the cover of the popular World Tennis magazine four times. She captained the U.S. Fed Cup team, reached the semifinals at Wimbledon in 1954, and the 1956 U.S. National Championships (now known as the US Open) in singles. 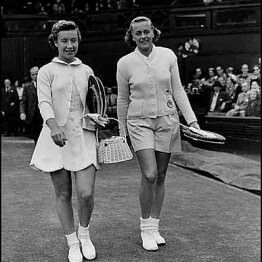 Her deepest run at a Grand Slam was finished runner-up in doubles (with Rollins teammate Shirley Fry) in 1956 at the U.S. National Championships. She lost to Althea Gibson 11-9, 6-1 in that 1956 U.S. National Championships semifinals, but said one of her most memorable matches was losing to Maureen Connolly in the Wimbledon semis. Equally important to her pro career was giving back to the game and enjoying tennis well into her senior years. In 1967 she received the USTA Florida Female Merit Award for being actively involved and making significant contributions to Florida tennis as a volunteer, and in 1983 she was inducted into the USTA Florida Tennis Hall of Fame. She was also inducted into the USTA Eastern Hall of Fame in 1988, received World Tennis magazine’s Marlboro Award in 1961 for contributions to tennis, and the USTA Service Bowl in 1968. In 1977 she founded the National Senior Women’s Tennis Association with fellow players Nancy Reed and Charlene Grafton in the Orlando area. “This was a way to get women out of the kitchen,” said Pratt of the organization that eventually expanded women’s senior tennis national championships to 11 additional age divisions (35-90) and all four surfaces. Pratt’s competitive spirit still shone bright at age 67 when she won the USTA National 60s Grass Court Championships, in the final outlasting a competitor seven years younger 7-6(2), 5-7, 6-2. “They think I’m over the hill,” said Pratt, who was working with the Orlando Sports Medicine Center to tailor a program that worked to increase her flexibility and endurance. At age 70 she won the ITF 65-and-over singles world championship, her fourth world title, and won the inaugural Kitty Godfree Cup (team 65-and-over) for the U.S. This was approximately a year after coming back from rotator cuff surgery on her shoulder. 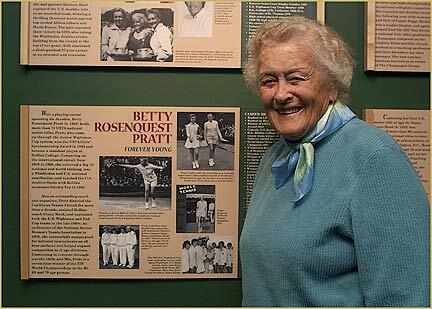 She amassed more than 75 USTA national titles over a playing career that spanned six decades.